Identify business problems that can be solved through analytics depending on the availability of data. Optimize the strategic decision making by developing a better understanding of customers and their choices. Problem space that needs to be addressed using data driven analytics in the niche domain has been identified. 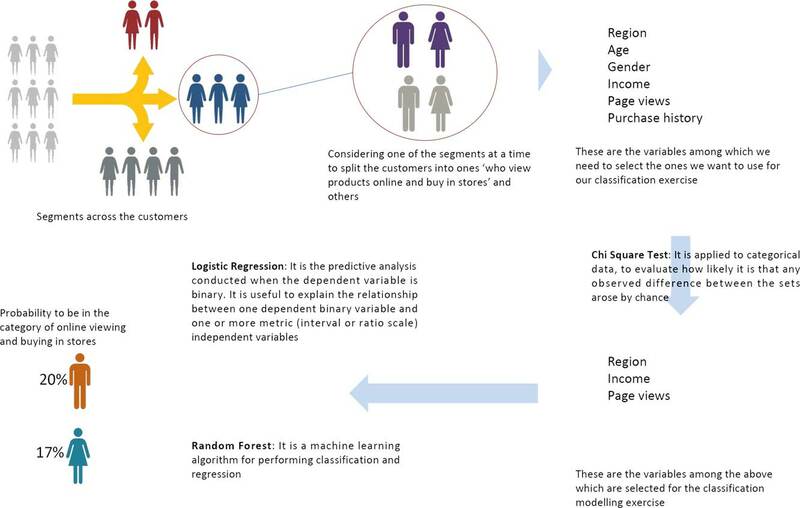 Customer segmentation, churn prediction, propensity modelling and recommender engines etc. have helped in data driven decision making. What are the most common problems faced by e-commerce companies? How to identify the customers segments to be targeted through various marketing campaigns? How to identify the likelihood of a customer to buy online? 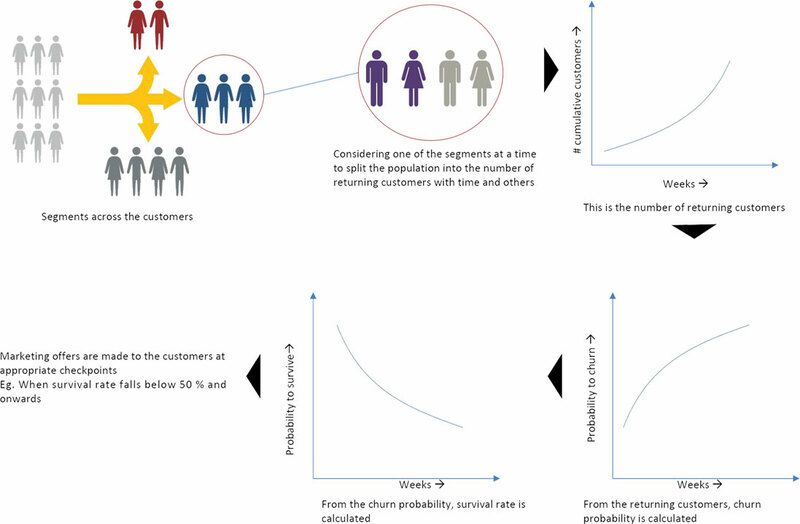 When can a customer churn and when should the efforts to retain them start? Which products should be suggested to existing customers? How to measure loyalty of the customers? How should pricing strategy & promotions be decided? How should inventory be managed & demand forecasted? How should the process be tracked & improved? How should the best vendor out of all be selected? For each month, the average growth for both the groups is compared against each other for all the 5 segments. It is an iterative unsupervised machine learning algorithm to cluster the data. How to identify customers who are likely to churn due to inactivity and when should they be sent promotional offers to retain them? How to identify the customers who are likely to view products on the website and then make purchases in stores? What are the products that should be recommended to the customers based on their past behaviour? Preliminary factors that affect personalized marketing. The data preparation phase covers all activities needed to construct the final dataset [data that will be fed into the modeling tool(s)] from the initial raw data. Data preparation tasks are likely to be performed multiple times and not in any prescribed order. Tasks include table, record, and attribute selection, as well as transformation and cleaning of data for modeling tools. Decide on the data to be used for analysis. Criteria include relevance to the data mining goals, quality, and technical constraints such as limits on data volume or data types. Constructive data preparation operations such as the production of derived attributes or entire new records, or transformed values for existing attributes. These are methods whereby information is combined from multiple tables or records to create new records or values. Formatting transformations refer to primarily syntactic modifications made to the data that do not change its meaning, but might be required by the modeling tool. 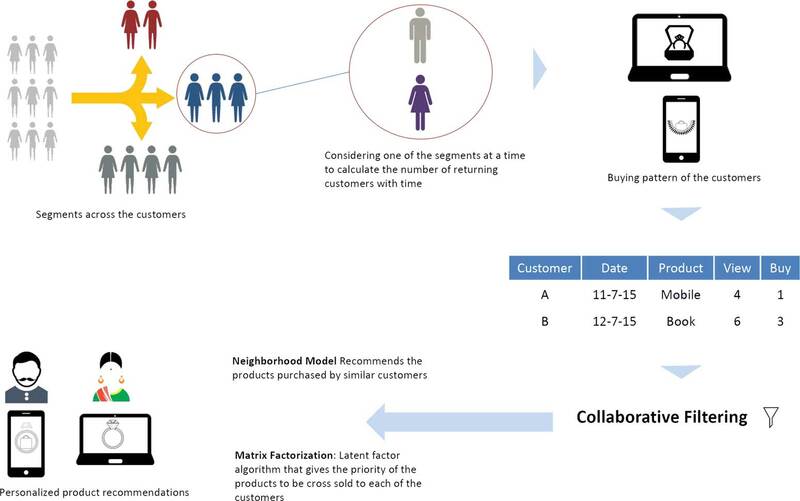 Create the final Data Set required for modeling and give business definition for proper consumption. The data understanding phase starts with initial data collection and proceeds with activities that enable you to become familiar with the data, identify data quality problems, discover first insights into the data, and/or detect interesting subsets to form hypotheses regarding hidden information. At this stage in the project, you have built a model (or models) that appears to have high quality from a data analysis perspective. Before proceeding to final deployment of the model, it is important to thoroughly evaluate it and review the steps executed to create it, to be certain the model properly achieves the business objectives.